Why don't ligatures have names? It is common to see ligatures such as Æ or Œ in reference to classical works such as Œdipus or Æsop but these do not seem to have names. Strangely enough in the Old English alphabet there were similar letters such as æsc or ash, and œthel or ethel. Is there a connection between the classical ligatures and the Old English ones? If so, why do we use Old English names and not Latin ones? And if not how rare is such a coincidence? Bonus question: It seems from the comments and answers so far that the only times we use ligatures are in reference to classical works but the only names we have for ligatures are Old English or Runic names. Why might this be? The Latin dictionary (Smith) gives the earliest date for Diphthonga as 450ish. Marc. Carp. ; Prisca. Two Roman Grammarians. And Ligature even later. 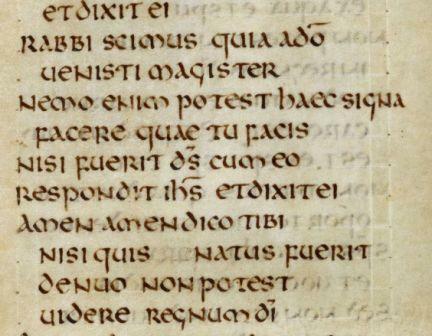 None of the early uncial manuscripts that I have so far looked at show ligatures, apart from the Divine monograms. The same applies to a web-site for inscriptions. There are contractions (sigla) in miniscule. The only other names for particular ligatures are also derived from Runic, the Irish ogham. Once again the names were needed when runic was transcribed into Latin. This doesn't explain why ŒÆ survived in French. Just to tidy up dates C680. Here's a detail from the Cuthbert/ Stoneyhurst Gospel still showing no ligature for AE; and 3 Divine monograms. do, ds, ihs. Picture Copyright British Library, permitted study. Not the answer you're looking for? Browse other questions tagged orthography history historical-change alphabet ligature or ask your own question. Where did the names of English letters come from, and why are they all monosyllabic (except for “w”)? Why did Old English use C while other Germanic languages used K?